Second wave. Aircraft badly damaged by flak on outward flight. Returned to base with mine intact. Frank Ernest Appleby was born in 1921 in Eastbourne, Sussex. He volunteered for the RAF at the age of 18, in August 1939 a few weeks before the outbreak of war. He was assigned to ground crew as a maintenance engineer, but then trained as a flight engineer. Appleby crewed up with Les Munro, Grant Rumbles, Bill Howarth and Percy Pigeon while at 1654 Conversion Unit in October 1942. He had completed some 18 operations with Munro in 97 Squadron when they were all transferred to 617 Squadron in March 1943. The Munro crew’s participation on the Dams Raid came to a premature end after they were hit by flak crossing the Dutch coast. They were next back in action two months later on the squadron’s next operation, where they flew on to a base in the newly liberated Algeria after attacking Italian power stations. 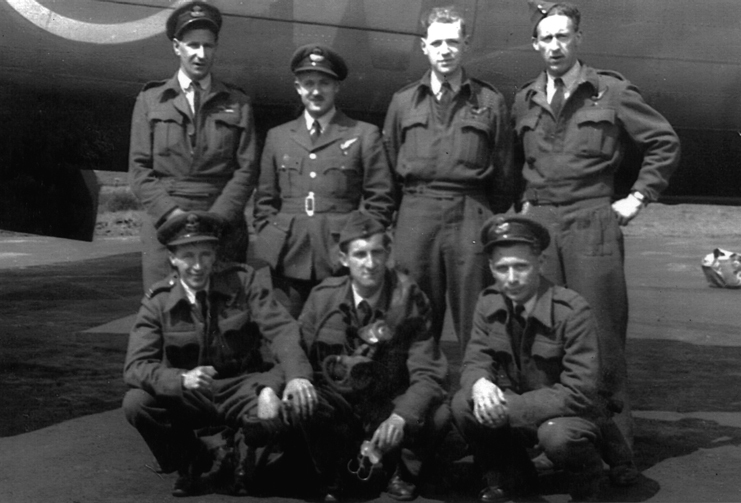 Appleby went on to serve as Munro’s flight engineer right through to the end of the crew’s tour in July 1944. Sorties 39. Flying Hours 248.25. Flight Sergeant Appleby has completed 39 operational sorties as a Flight Engineer against heavily defended targets in Germany, Italy and France. He began operating in January 1943, and chose on the expiration of his first tour to carry on without a rest period. He has always enjoyed the complete confidence of his captain by his capable handling of the engines. When the aircraft has been heavily engaged by enemy defences, he has always displayed exceptional calmness and presence of mind. Since volunteering in March 1943 to join a special duties squadron, his utter contempt for personal safety and unflinching courage have proved an inspiration to all his crew. He is therefore strongly recommended for the award of the Distinguished Flying Medal. (10 April 1944). Although he was a firm believer in a bomber crew’s strict hierarchy (the pilot was “the leader, the boss, the director of what went on in the aircraft”), the ever-cautious Munro eventually had enough confidence in the man who sat next to him for so long. [Munro] learnt that many pilots handed over the controls to their flight engineer on their way home. “This practice became more common as the risk of Jerry night fighter attack diminished. I must admit that it was a long time before I was prepared to hand over the controls to Frank and when I did he handled them quite well. When I was confident of his ability to stick to the course and height I would take over from the gunners in their turrets and get a feel for their contribution to the team effort.” John Sweetman, Bomber Crew, Abacus 2005, pp.111-2. Munro and all his crew were finally taken off operations in July 1944, each of them having completed more than 50 sorties. Appleby went on to serve in various administrative and training functions in the RAF until the end of the war, when he returned to civilian life. Frank Appleby died in Sussex in 1996.